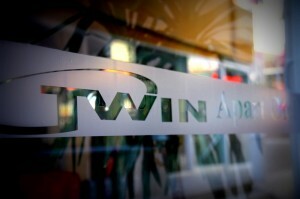 Twin Apart Hotel is a 2 building hotel offers Wi-Fi and fully equipped apartments with furnished balconies. All rooms include air conditioning, TV, kitchen with a mini bar and a dining area. The rooms also offer private bathroom with a shower and a hairdryer. All rooms have balconies. Twin Apart offers an à la carte restaurant. Guests can use sun loungers by the pool area and have drinks at the bar. On the Blue Flag Cleopatra Beach nearby guests can relax, swim and explore the beautiful caves. Restaurants and bars are also available close to Twin Apart Hotel. The hotel is 3-min walk from famous Damlataş Cave, 7-mins walk from Alanya Harbour and 135 km from Antalya Airport. Free parking is also available nearby. We are waiting you in our hotel!